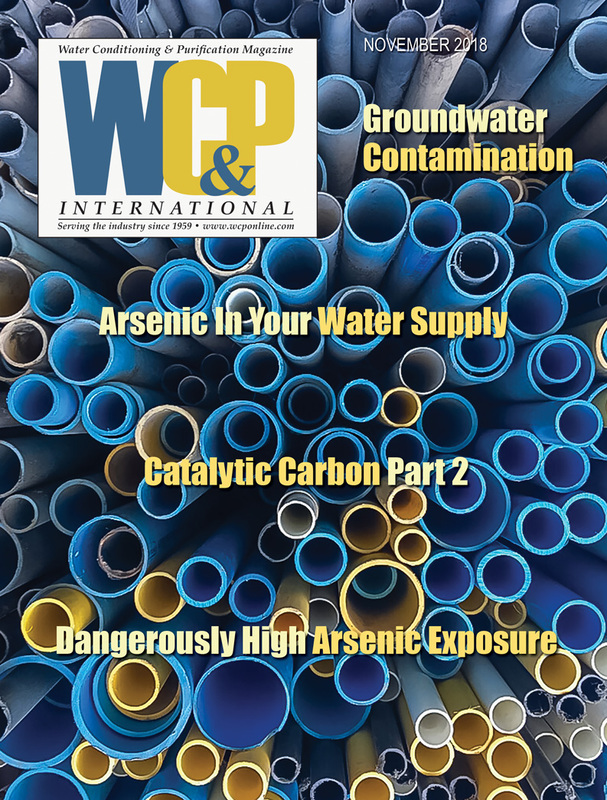 Each spring, we discuss commercial and industrial water treatment with our readers, and each spring, I field a number of calls from dealers across the country needing help on projects where they have engaged something more complex than their skill set could handle. While tackling commercial and light industrial work can be a natural expansion of the work that you already do, please, please understand that commercial and industrial systems are not necessarily just bigger versions of residential systems. This is like comparing a Mini Cooper compact car to a Mack semi-truck. While they are conceptually similar, one is not merely a bigger version of the other. With the average residential water softening application, the worst thing that can happen when it doesn’t work properly is an inconvenience in the customer’s lifestyle, a temporary increase in expense and a clean-ing burden. If the softener in a laundromat fails, the soap doesn’t work as well; if the softener at a car wash fails, the cars aren’t as clean and the RO membrane(s) will fail faster. If a softener fails for a critical boiler protection application (even a small softener), the consequences can be catastrophic and devastatingly expensive. 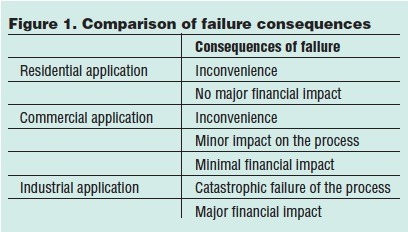 The consequences of failure, therefore, are really what differentiate commercial and industrial from residential applications. When you’re evaluating the client’s application, be sure to carefully understand what the true consequences of failure are so that you are able to meet and exceed their expectations for deployment, longevity and redundancy. If you still want to work in the commercial and industrial sector, before tacking the first project you need to learn about the process or application, understand the environment in which you will be working and deploying the equipment, and also understand the legal implications of the work that you are considering. Each process has certain specific water quality criteria. 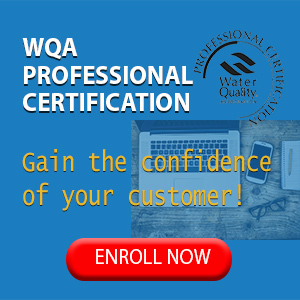 Whether you’re simply providing a particular quality of water as specified by the project engineer or you’re acting as the consultant to solve a water quality problem, it is important to understand the actual water quality required and create a reasonable set of expectations for yourself and the client. 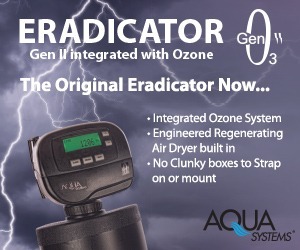 Consult with the manufacturer of equipment to be used in the client’s process to ensure that you consider their operational water quality requirements for best performance, as well as warranty validation. • What times of day are convenient to the client (if any) to install a bypass loop? • Are there any dimensional constraints to the system (doorways, height, floor space)? • Are there any weight limitations (is equipment to sit on a platform or be wall-mounted)? Don’t be afraid to ask lots of questions; it’s much more important to ask questions now than to wish that you had later. • What is the actual quality of the water needed? • How many hours of run-time will be required per day/operating cycle? • How much water will be used per day/operating cycle? • Is any major change (increase/decrease) in water consumption to be expected in the near future? Your C/I client has a dramatically different set of expectations than a homeowner. Plan for an escalated response to all service issues, as well as a more critical analysis of product water quality. Perform additional tests as needed, especially if the water supply is non-municipal or in an area where the municipal supply quality is known to fluctuate. Armed with an influent water quality analysis, you’re ready to compare the raw water against the process water requirements. Always use appropriate certified testing facilities. Now is not the time to cut corners or be cheap (there’s never a good time for that). Work closely with your equipment vendor to ensure that you specify an appropriate solution for this project. Have a frank discussion about who will be liable if the incorrect equipment or technology is specified,the extent of that liability and what recourse you have to protect yourself. I often see commercial projects where the previous contractor has undersized the equipment or caused an unacceptable pressure drop in the delivered water. Pay particular attention to functional flowrates and pressure drop through the entire treatment train. While periodic service is important for residential water treatment systems, preventative maintenance is critical for commercial and industrial systems. Your equipment manufacturer should have a model preventative maintenance schedule for you that can be tailored to a specific project. Discuss this with the client to ensure that the equipment is properly maintained. Your goal is to prevent or fix problems while they are cheap and easy, with a minimum of operational downtime. If the system includes consumables like acid, caustic, coagulants, flocculants,polymers, chlorine neutralizers, resin cleaners or performance enhancers, be sure to develop a consumables replacement schedule to facilitate easy procurement of consumables by your clients. Carefully document the expectations of both parties with a reasonable procurement and installation timeline. Carefully review (or have your lawyer do it) all purchase orders and letters of engagement before accepting them, to ensure the terms are as originally negotiated and that you understand lien releases, delay penalties and other commercial terms that will inevitably be included. Installation should be sub-contracted or performed by your in-house installation team to be on time and within the criteria agreed to by the client. This is not house plumbing and will often require the installer to have additional training, licensing and insurance to complete the work. Consult with the appropriate local code enforcement office to make sure that the project is compliant with all local codes and that the necessary permits have been acquired. 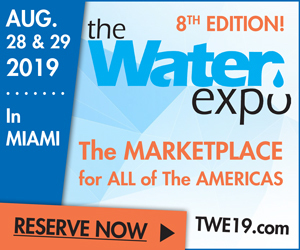 In addition to following the law, you’d be wise to follow industry best practices by learning from your peers in magazines like this one, at trade shows (WQA Aquatech is this month in sunny Las Vegas), WQA’s new Modular Education Program (MEP) and from equipment manufacturers. Treat the client’s facility with respect by being punctual, clean and orderly on the job site. Respect their corporate culture and be sensitive to dress codes and job-site behavior. While selection, sizing and installation are important, the startup cannot be overlooked. This important step involves systematic filling, rinsing, pressurization, sanitization and disinfection of the water treatment equipment as well as sanitizing the downstream piping, fixtures and apparatus. This should be done to prevent contamination that could compromise human health or the client’s workflow. Be especially mindful of new regulations and concerns, like ASHRAE’s proposed Standard 188. Once the system has been properly commissioned, draw samples of the effluent product water and have them tested by the same testing facility as the original tests for uniformity. Save copies of pre- and post-treatment test data in your project binder. Unless you’re planning on having a member of your staff onsite 24/7, you’re going to have to train your client or their employee(s) on the proper, regular operation and maintenance of the water treatment system. This does not take away from your periodic maintenance visits; it empowers them to keep things running between service visits. Take the time to train carefully, as many warranty issues are usually caused by operator error, which inevitably stems from inadequate training. Reasonable expectations are the key to healthy commercial/industrial relations. Commercial and industrial water treatment is certainly not for everyone, and I know many dealers who have built very profitable and rewarding businesses without venturing outside the residential realm. Don’t allow yourself to feel pressured to dive into the C&I market just because your competitors have done so. Be sure that you carefully analyze the risks and benefits,as well as the impact they will have on your company before you over-commit yourself. Don’t be afraid to gracefully withdraw and defer to a more knowledgeable/experienced col-league if you become uncomfortable during the initial discovery process. Don’t be the fool who rushes in.